Montessori Nature School is proud to offer our Hand in Hand program--a truly unique adult-child learning experience. This program is designed to offer our youngest learners the opportunity to explore and discover in a Montessori classroom. 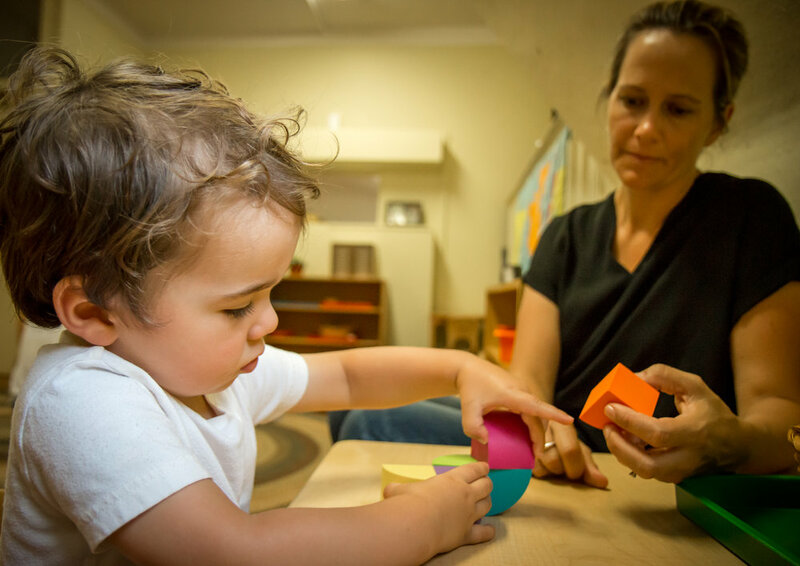 In this Montessori-inspired playgroup, each child is accompanied by a consistent caregiver (a parent, guardian, grand-parent, babysitter, or nanny). We welcome families to join this program to learn more about your child's development, discover how Montessori learning differs from other educational methods, and find out if Montessori education would be a good fit for your family. Our Hand in Hand program is purposefully designed to offer young children the opportunity to explore and discover in a Montessori environment. The hallmark of an authentic Montessori classroom is a beautifully prepared physical space equipped with quality learning materials. Our child-sized classroom is designed with the young child in mind. From the furnishings to the organization, children are invited to touch, feel, balance, experiment, ask questions, etc. Hand in Hand is all about exploration and discovery for these young learners. The shelves are filled with materials that are Montessori-inspired, developmentally-appropriate, and engaging to the senses. Connecting children to the natural world happens through everyday outdoor experiences. Our own backyard woods are the perfect setting for daily hands-on nature exploration. We hunt for insects, "cook" in our mud kitchen, wade through streams, and build with fallen logs. And we explore outdoors in ALL kinds of weather (rain or shine)! Each child will be enrolled with an accompanying caregiver--it may be a parent, guardian, grand-parent, babysitter, nanny, etc. This designated caregiver will consistently attend with the child, allowing both to get the most out of the Montessori classroom experience. Just as the children will be learning, so will the adults. Each week, the attending adults will receive a focus topic, articles to read/share, and plenty of opportunities to ask questions. Share your parenting challenges, insights, and joys in our supportive group. And take home time-tested ideas to bring Montessori home to further nurture their child’s development.